Advanced Medical Life Support (AMLS) - Emergency Medical Training Professionals, Inc. The Advanced Medical Life Support (AMLS) is a two-day in-depth study of medical emergencies. This course emphasizes a pragmatic approach and format, based on teaching providers what they need to know. The curriculum is designed to allow for a minimal amount of lecture and an ample amount of actual hands-on physical assessment of patients. Therefore, students must purchase a copy of the AMLS textbook, published by Brady/Prentice Hall, in advance of the course in order to adequately prepare for it. Because medicine is every changing, periodic revisions and updates will be required as the scientific and medical fields uncover new advanced and techniques. The applied AMLS course gives each provider/student the ability to integrate the knowledge presented into a practical format for use in his or her current practice. This course is directed at the pre-hospital treatment of medical emergencies, but can be altered to encompass the initial emergency department assessment and management of the medical patient. 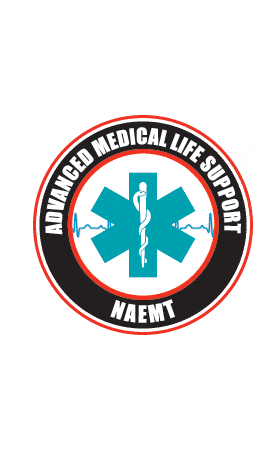 The format and administrative policies set forth are those of the National Association of Emergency Medical Technicians (NAEMT). Course participation is open to all providers: EMT-Paramedics, EMT-Intermediates, EMT-Basics, and to Registered Nurses or Physicians with at least one year of clinical experience. This will ensure that participants have the base knowledge and experience on which the AMLS course will build. To successfully prepare for the course, the student must read the text prior to course commencement and come to class prepared. After successful completion of the course and examination, you will receive a certificate of completion that is endorsed by the National Association of EMS Physicians (NAEMSP), accredited by the Continuing Education Coordinating Board for Emergency Medical Services (CECBEMS) and is recognized by the National Registry of EMTs (NREMT). The certificate of completion is valid for four years.